Want to know how to hide files and folders in Windows 10? Don’t worry – it is pretty simple, and we are going to show you all the steps. Sometimes, we may keep sensitive data on our computers, so there is a need to put them someplace secure. What can be more secure than the option to completely hide these from the prying eyes? This may sound like a complicated task, and actually, it is quite simple. There are two ways to do this. 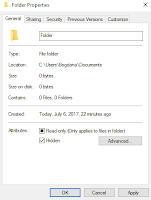 Using the File Explorer, or Command Prompt. The first option is simpler, so we are going to show you that one. Without further ado, let’s see how to hide files and folders in Windows 10. Select a file or a folder you wish to hide. In this case, I want to hide a folder. It has some subfolders and files in it. So, when I clicked Apply, the pop-up message showed up. That’s it. The files and folders are hidden. How to access these files and folders now? If you go to a location in File Explorer where the files and folders were before, you won’t see them there – they are hidden. So, here is what you need to do. The moment you do that, all hidden files and folders in Windows 10 will show up. Then, if you don’t want to hide a file or a folder any longer, you can select the folder, click properties, and uncheck “Hidden”, and click Apply. Also, if you don’t want other hidden folders to be available, make sure to click View again, and uncheck “Hidden items”. Now you know how to hide files and folders, and how to access them after that. You can keep all the things you want safe and secure, and of course, away from prying eyes.